Like a little spice? 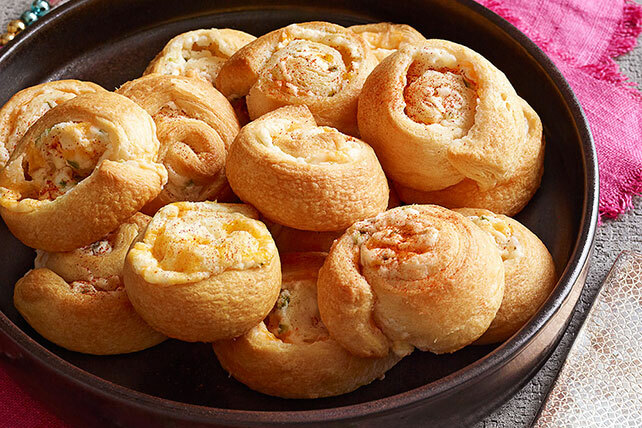 Chances are you’ll like these Jalapeño Pepper Pinwheels too. They’re perfect for a party or pre-dinner appetizer. Unroll crescent dough; separate into 4 rectangles. Firmly press perforations and seams together to seal; spread with cheese mixture. Roll up each rectangle, starting at one short end; cut into 4 slices. Place on baking sheet; flatten slightly. Bake 15 min. or until golden brown. Cool 1 min. before removing from baking sheet. Serve warm. Sprinkle pinwheels lightly with ground red pepper (cayenne) before baking. Jalapeño pepper heat levels can vary depending on many factors, such as the age of the pepper, how many seeds are in the pepper, and when and where the pepper was grown. When using jalapeños in recipes, feel free to adjust the measure of the peppers according to your personal preference.